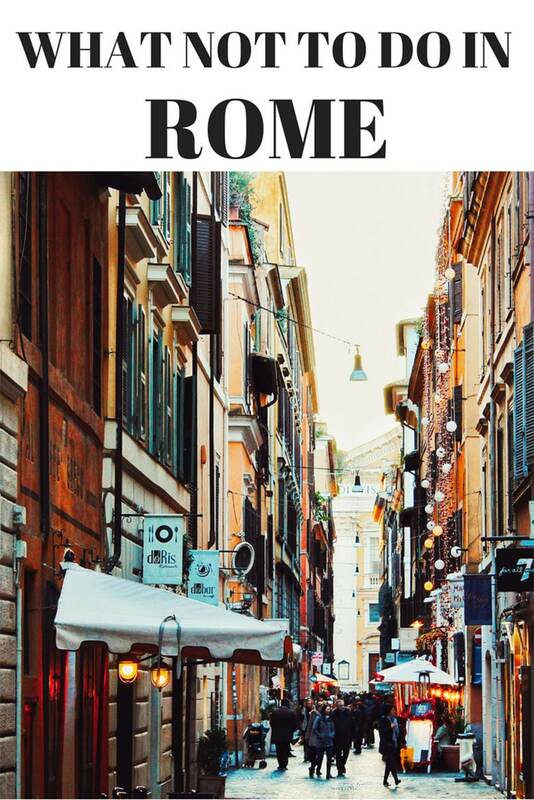 Aaa Rome, such a beautiful place, I mean who doesnt want to go there? With the Italian gelato, the fashion, all that rich history oh and of course don’t forget the cute Italian guys, why wouldn’t you want to go? 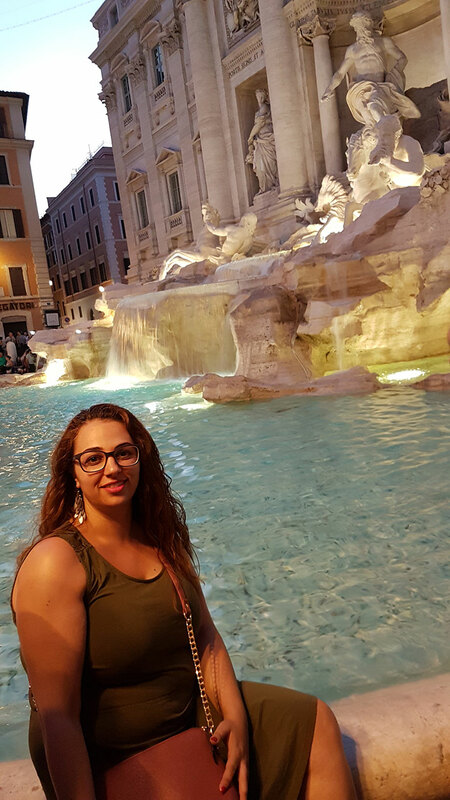 Rome and to be exact Italy, has so much to see and do! 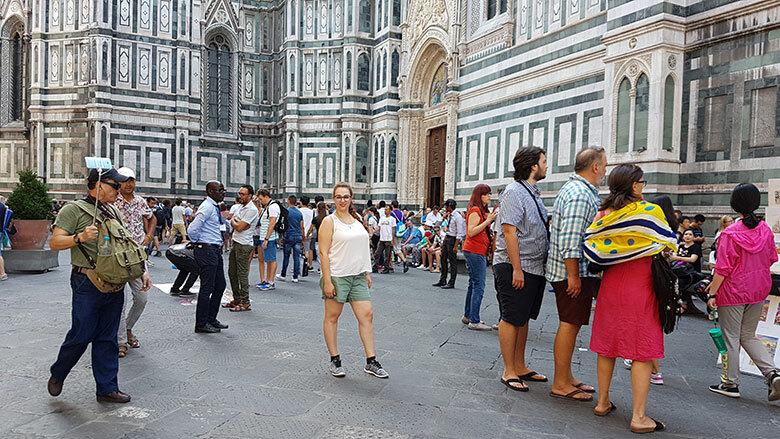 So if you are going on holiday to Rome or anywhere else in Italy then this post has some pointers for what you should not do while you are there. We all know most of these pointers but it is always good to read them again and refresh our knowledge before our trip. You may even read something that you didn’t know before. Read before you travel helps you to plan your holdays better. 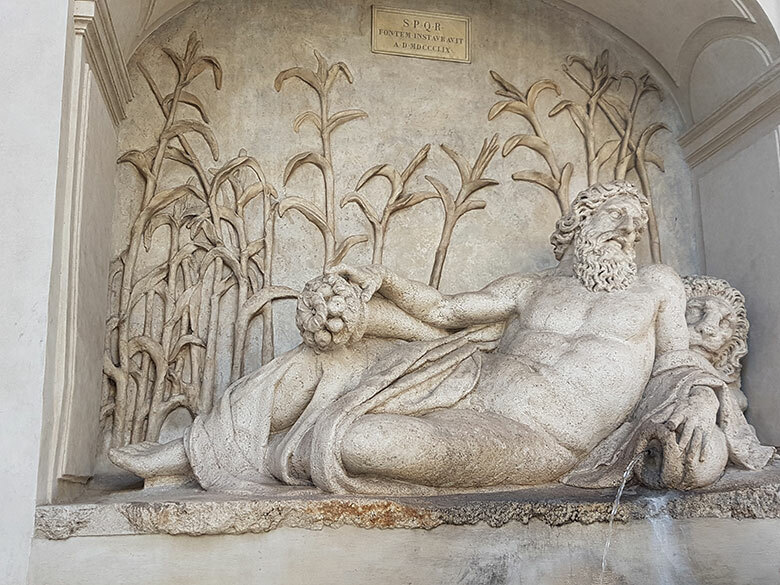 If you also want to plan your holiday in Rome then read my full 4 day itinerary here. 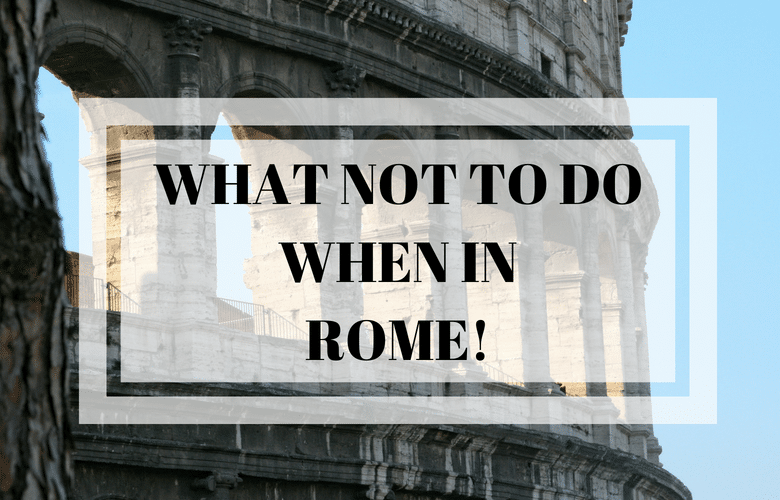 So let’s get started with What Not to Do in Rome! 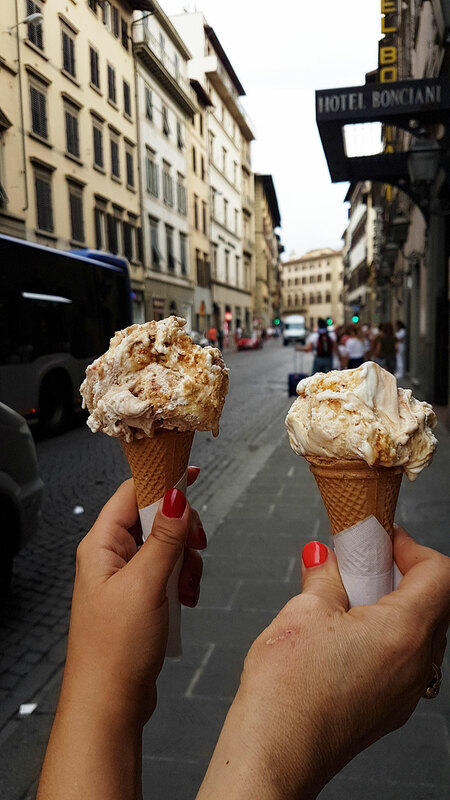 THE BEST GELATO IS IN ITALY! Do not eat near the tourist attractions. No matter how hungry you are please please please do not sit at a restaurant that is near an attraction. Try at least going a road further away from the first touristy restaurants you find. This is to make sure you eat a wonderful meal and paying at a local rate and not like the touristy places that offer international cuisine and very over-priced. The further away you go the better. The quality of the food is much better but also you will be eating amongst locals and really eat what locals eat. Do not and I repeat do not accept roses from any guy who passes by you on the streets. They will tell you how pretty you are, hand you the rose and when you turn around to leave they will demand payment for the rose. So unless you want to pay for a rose (an expensive rose) I suggest you just politely say no thank you and continue walking. Well this is a chapter on its own. They have mastered some really sneaky tricks to play on people and believe me when I say that you will not know what hit you! Scenario 1: An old lady (gypsy lady) will be holding a baby (only it’s a doll) and she will pretend to trip and fall and she will try to throw the baby in your direction. This is so that you will catch the baby and another person (her apprentice) will be somewhere close by and he/she will pick pocket your pockets or even bag. Sometimes they will even cut your bag from the handles and you won’t realise a thing! Scenario 2: The same as the above but without the baby. She will try to fall in your direction and maybe throw her bag on the floor so that you will help her pick everything off the floor. While her accomplice steals and pick pockets you. Scenario 3: The classic beggar! He or she will be sitting on the floor begging for money. While you place your change they might touch your hand and say thank you but without you realizing anything they have just stolen your ring or watch or bracelet. Scenario 4: Now this one is similar to scenario 3. They will try to sell you something and in the end they will have stolen something on your hand or even your bag! So as you can see they can be really resourceful when it comes to finding ways to steal. I guess the easy money is best for them! I don’t know how the police cannot catch them or do anything. These gypsies can be found everywhere so I am still confused as to why the police do not put them away. But anyway that’s another story that really hasn’t got anything to do with us (lol). While we are on the topic of pickpockets, try not to carry on you and important documents, ids or passports. Those who pick pocket will not care what you have on you and they will take these items along with everything else. So keep a copy of these documents if you need it otherwise keep it at the hotel for safe keeping. ONE OF THE MANY WATER FOUNTAINS IN ROME! There are so many fountains with free drinkable water that it is a shame to buy bottles of water. Why spend so much money on buying water at a touristy price and not buy one bottle and refill it from the many water fountains around Rome. Or if you like buy 2 or 3 bottles and freeze them in your fridge at the hotel. That way you will have iced cold water all day long AND it is free! Do not use taxis. There is no need to use taxis. Not even locals use taxis. Most locals and tourist walk or use the buses. The buses are cheap and walking is even better for your pocket and your health. So do not use the expensive tariff of taxis. The only time I will agree with you to use a taxi is to go from and to the airport. Some will not agree with me as there are also trains and buses that go directly to the airport, but I like to be sure that I will be there on time and in the right place! Whatever you do, DO NOT walk alone at night in streets that are not well lit and have not people around! This is very important! Not only in Rome but in any city or country you visit you should not walk by yourself in dark streets where there isn’t anyone around. 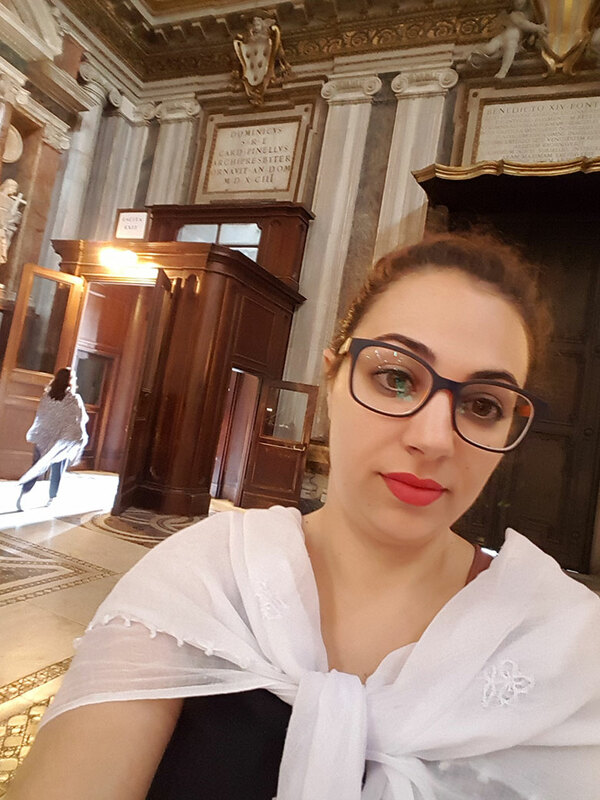 Now I am talking from my experience in Rome. The first night we were there, we decided to go out for dinner. On our way back to the B&B we took a different street back (we wanted to explore) and boy did we make a big mistake. We ended up in a street where there was hardly any light, we couldn’t figure out where we were and all of a sudden a black SUV stopped in the middle of the road. You could not see into the car as all windows were tinted. Have in mind we were 4 ladies traveling together and if it weren’t for the 4 of us being together at that point, who knows what might have happened. I was walking in front with one of my travel buddies, while about a meter behind us were the other 2. The other 2 behind us caught up with us and we continued to walk away from the car. The car ended up driving away in a rush but who knows what they were going to do! So as a general rule don’t walk in dark streets alone! You never know what might happen. 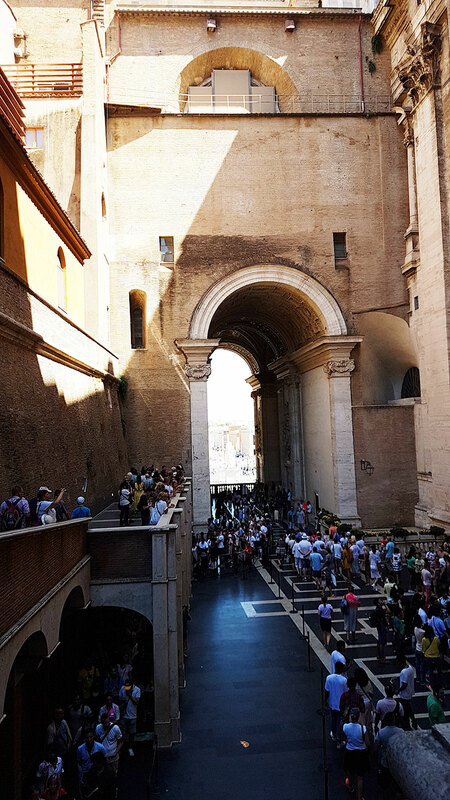 Make sure you book skip the line tickets to the major attractions like the Colloseum and Vatican City. Don’t sit in that line and wait in the line for hours in the heat to get in. Save some time and plan ahead and pay the extra money to get in and not wait. It is well worth the money, trust me! Do not go against the strict church dress code. You must cover your shoulders and girls must wear dresses that cover their knees! What I do is always have a kimono or a shawl (or 2) to make sure I can cover up when entering. Do not assume they will have cloaks there for you as sometimes there will not be enough to go around. Also who wants to wear a cloak that so many others have worn and in the summer! Can you imagine? No way, I wouldn’t wear it! COVERING UP IN CHURCH! ME NOT SO HAPPY AS IT WAS TOOOOO HOT TO COVER UP! Italians do not eat and walk at the same time. You either stand at the bar to eat or drink (which is cheaper) or you sit at a table and pay a small fee for the service. This is known as a servizio. You also pay extra for the bread, so if the waiter offers some bread and you do not want to pay for bread, kindly say no thank you. Another thing to have in mind is that locals do not drink Cuppuccino after noon. So if you do not want to be looked at in a wierd way, don’t order coffee after lunch time. If however you do not mind, by all means, order one! 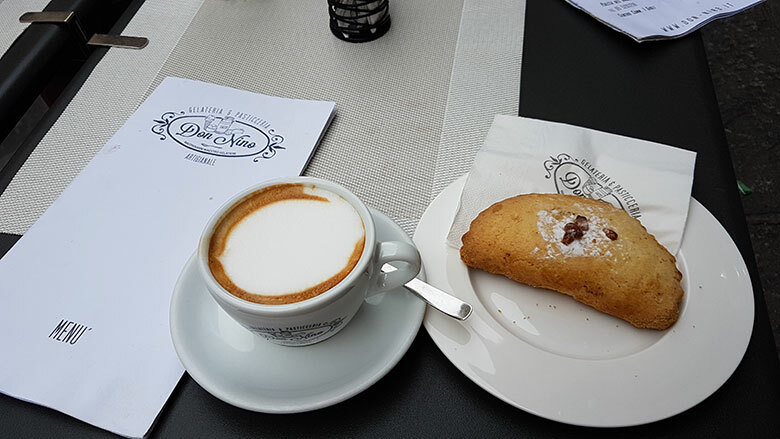 Keep in mind the breakfast that locals have is usually and espresso or cappuccino with a sweet pastry only. So don’t go looking for a full buffet or a huge breakfast! When paying the bill, ask for it to be itemized and not total. Make sure to check it and if there is no coperto (service charge) then you can tip them but not too much. They usually tip them by rounding up the bill. So if it is €36, you would round it up to €40. One more thing is to not expect customer service to be 100%. The whole system doesn’t work the way it is in the US or UK. Heck I’m in Cyprus and I find our service here a lot better than the service we got in Italy. So do not be shocked when you see the big difference. Ok so this isnt really a don’t but it is my advice to ALL of you. Please don’t go to Rome during the summer months. If you can go there during a different season, then go. The summer heat just doesn’t help you. You are not able to do everything you want to. You feel hot and sticky and sometimes you just don’t enjoy it as much as you could have. Try Spring or autumn but the truth is that no matter the season you go Rome is one of those cities that has tourists all year round. They really don’t have and low season, it’s always full of tourists! MUST TOSS A COIN INTO THE TREVI FOUNTAIN! Don’t forget to throw a coin in the Trevi fountain, the proper way! Throwing the coin from the right hand over the left shoulder means that you ensure that you will return to Rome in the future. Please do not just go to museums, churches and attractions without checking their opening hours. For example, museums are closed on Mondays. Make sure to plan ahead and confirm that attractions are open when you plan to visit. 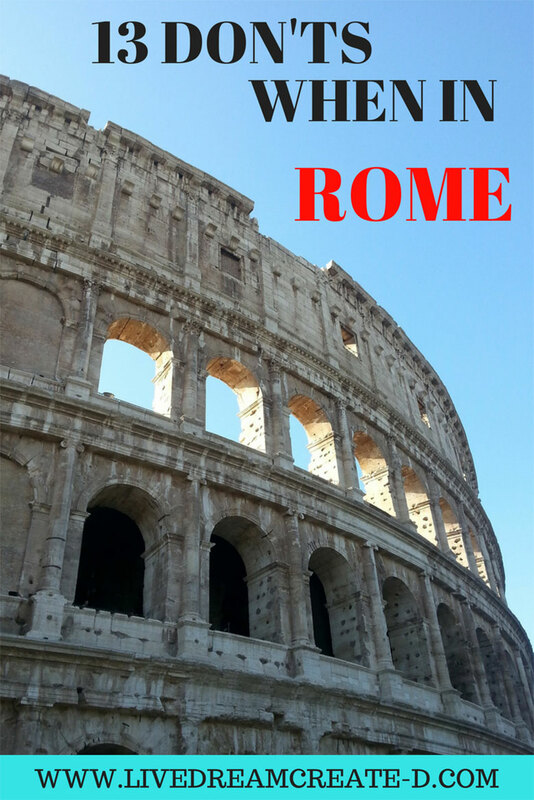 Lastly please do not forget to research the history of Rome before going. It is always good to know the history of a place before going so you can understand their culture and ways. It will also help you understand and know what exactly you will see at the attractions and museums. 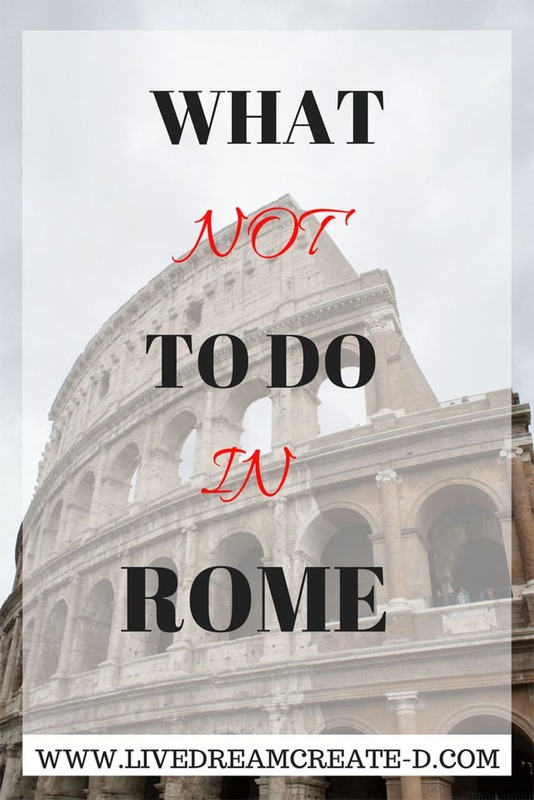 With all these don’ts I hope you will not be discouraged to go to Rome but instead help you with your planning and prepare you well for your trip. If you have any other DON’TS that I have not covered please let us know below in the comments. Such an interesting spin on typical travel guides. The only thing I would disagree on is drinking the fountain water. Unfortunately I got very sick from it because my immune system wasn’t used to it. But definitely not the norm!! Really?? You poor thing. To be honest we didn’t drink too much water from the fountains as both I and one of the other girls were ill and so we took more coffee breaks than normally so we bought water bottles from the cafes too. Luckily we didn’t have any issues with the water that we did drink from the fountains. 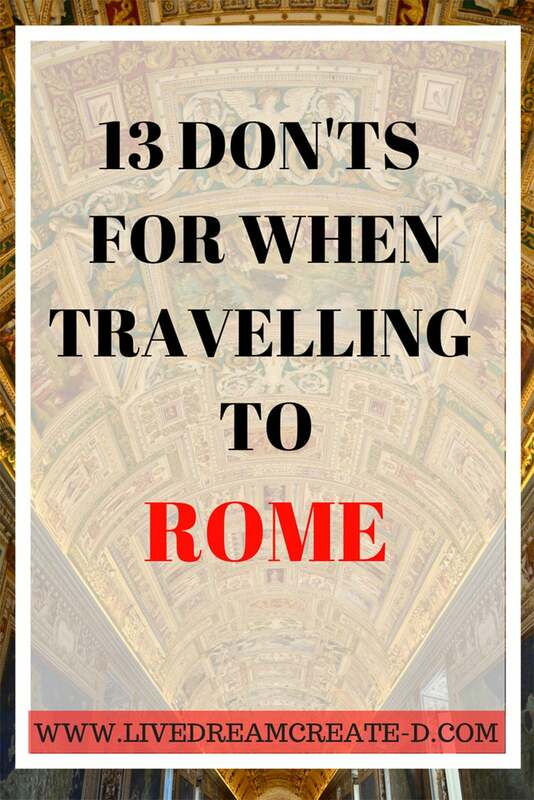 We are talking about visiting Rome so all of this is wonderful advice that I didn’t know about. Thank you in advance for making our trip and time in Rome that much better. I hope you have a wonderful time in Rome. Please share some photos with us when you get back! Interesting post. Great tips for those who have never been. Thank you Mary. This was my goal, in helping others before they go to Rome. Have you ever been?